In addition to this series here's one more book. I have become huge fan of Doctor who series. This book here has crossed earth and even galaxies .The story of this book runs in time dimension and black hole and anti-matter. I'm fantasized by the approach of writer here.Each and every aspect is covered .National security,Alien invasions,time travel,inter galactic forces,inter planetary relations and monsters etc. One cannot imagine to the extent this series has gone. 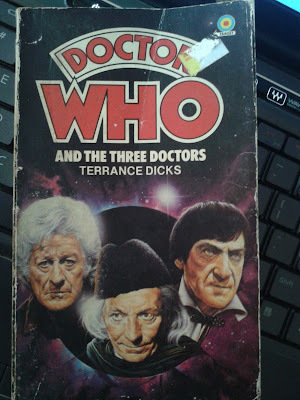 This book's theme is in space and time dimension. Sometimes even time lords have to break their own laws.So here we have three doctors from different time streams.Younger and dynamic,present and thoughtful, older and wiser him. It's quite fun to read about their meeting.One can assume if we happen to meet our past what we would do!!!. Villain of the story is Omega. Who is he!!?? well read the book ,I don't wanna be spoilsport here :) . To make you more intrigued i would say ,what if we could enter a black-hole!!??. What would it be like. are the theories true that a black hole can be a gateway to cross over time and space.Can anti-matter exist !?? .This book has limelight over such topics in the story beautifully written and used. I have the Hard copy .One who wishes to read Contact me :) .